There is good news from Australia, in the Diocese of Maitland-Newcastle, approximately 100 miles north of Sydney. 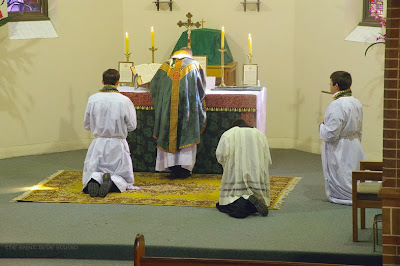 The Newcastle Traditional Latin Mass society has been formed there as a lay response to Summorum Pontificum. 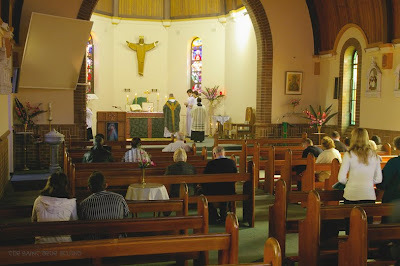 Since the ecclesial hierarchy there has not undertaken to implement Summorum Pontificum, a group of young dedicated laity has set about making the Extraordinary Form Mass available on a more regular basis due to the generosity of one Parish Priest allowing access to a parish Church and the generosity of visiting religious and diocesan clergy from outside Maitland-Newcastle who are proficient in the celebration of the Extraordinary Form. This stable group has found a more permanent home at Saint Patrick's Catholic Church, in the parish of Wallsend many Sundays. Last Sunday, we were fortunate enough to have our first Missa Cantata celebrated by Father Terence Mary Naughtin OFM Conv. pictures are provided of this momenteous occaison - the first Sung TLM in this diocese for quite some time. It goes to show, that even where the bishops and clergy are inactive in supporting Summorum Pontificum, still with good will there is much the laity can do to mobilise and support the cause. With all the beautiful pictures of traditional Masses on blogs, we may perhaps forget that there are those who are still struggling with opposition and indifference. I am happy to help the active laity in a small way by giving publicity to Masses such as these that they have taken so much trouble to arrange.